The most waited destination` to be in Manali this season is here! Nestled between scenic hills, Red house Inn provides extraordinary escape with organic architecture, panoramic views of the Himalayas and Manalsu River. Standard Rooms: Spacious, outward facing and totally furnished rooms, a modern and fully equipped bathroom with relaxing hot shower facilities. 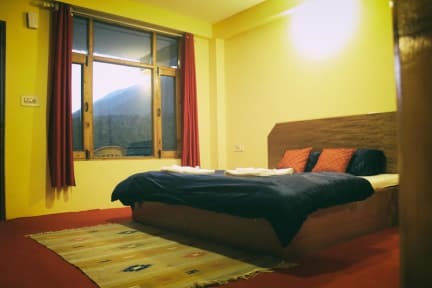 The rooms come with magnificent glass windows offering views of Solang Valley, the luscious greeneries of Himalayas and activities in the vicinity. A small chill out place in the balcony and ample of garden spaces set the stage for you to unwind and relax. Luxurious Bunk Beds Hostel: Red House Inn is the ultimate backpackers’ haven. 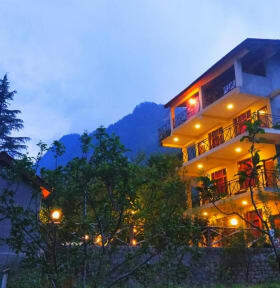 An affordable price and excellent location makes the Inn the perfect platform to explore Manali. Our café offers large and clean dorm rooms with freshly laundered linens, privacy curtains, and power switch for all the beds. The bathroom is equipped with all amenities and 24 hours running hot water. We have a large balcony and garden to chill out along with FREE WIFI and BOOKS to read. Outdoor Cafe: An autogenously operated garden café with Continental, ALA CARTE English …… dishes are available. Offering healthy meals, Red House café draws on culinary traditions and ingredients native to Manali. Come and enjoy our selection of homemade courses. Workforce: Enjoy our class leading service and hospitality through 24 hours front desk assistance ,quick check-in and check-out, adequate staff at your service and chefs with thick years of experience who will give you a lip-smacking taste!!! So what are you waiting for?? Get yourself a spot before its clocked!! !